Patio heaters come in at least two types. The most common of them is the floor-standing type, which is a heater with a base and can be moved from one place to another. Another type is called a parasol patio heater, so-called because it is attached to an umbrella or suspended from a gazebo. 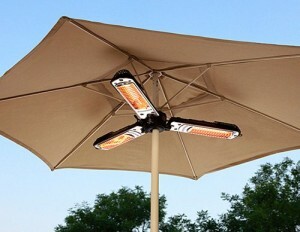 An example of a parasol outdoor heater is the HLI-1P from AZ Patio Heaters. In our previous post, we reviewed the AZ Patio Heaters HLDSO-WGTHG and gave it a positive recommendation. 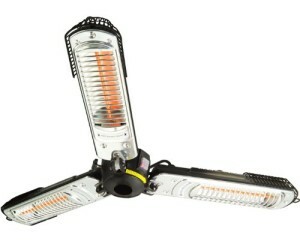 Is the HLI-1P parasol patio heater any good? Find out in this review. In a hurry? Check out the HLI-1P here! – This is an electric heater and can therefore be used outdoor or as an indoor heater without fear of burning, damaging your property, or carbon monoxide poisoning. – It is designed under a patio umbrella, so it has three units or arms. Each arm is 500 watts, making the whole heater to be 1,500 watts. Also, the arms fold down for easy storage. – It’s made in China, and it weighs 11 pounds. – Performance. It is not effective for very cold weather. Plus, compared to gas / propane heater, it doesn’t cover a wide area. – Ease of use. Compared to propane-powered patio heaters, the HLI-1P is easy to use. But the hassle comes in when you need to take it off when necessary (e.g., too much wind) and then installing it again. – Cord. The electric cord is short, so you may need an extension cord, which you can trip over at night. If you’re on the market for a quick or simple fix for mildly cool evenings, the HLI-1P electric parasol patio heater is ideal for you. It’s easier to use than propane-powered heaters, but don’t expect it to cover a large area.